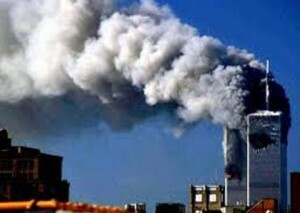 Twin towers were destroyed by controlled explosion. Truthers say video footage of the buildings falling points to demolition due to the way the towers bend before collapsing. Also, there appear to be explosions as the windows blow out, floor by floor, from the top downwards. But demolition experts collapse a building from the bottom not the top. Experts say the windows were blown out as each floor collapsed on to the one below, sending debris and office equipment flying out. A white jet was seen flying over the United 93 crash site. At least six eyewitnesses say they saw a small white jet flying low over the crash area almost immediately after Flight 93 went down. There was such a jet in the vicinity-a business jet owned by the VF Corp. of Greensboro, North Carolina, that said they did go low down within 1,500 feet of the ground. They saw a hole in the ground with smoke coming out of it. They pinpointed the location and then continued on. World Trade Centre Building 7, adjacent to the twin towers, must have been destroyed by controlled demolition because it was not hit by a plane. This theory is partly based on a remark by the owner of the building who, fearing it was about to collapse, said firefighters inside should be brought out immediately. He used the words: “Pull it”. This remark has been interpreted as slang for demolishing the building. In fact, the collapse was caused by intense fires in one of the neighbouring twin towers that spread to WTC 7, causing its steel beams to buckle and the building to come down. Israel carried out the attacks in order to draw the US into attacking the Arab world. The evidence claimed for this theory is that 4,000 Jews who supposedly worked at the WTC failed to report for work on 11 September because they had been forewarned by Mossad. This seems based on a statement by the Israeli foreign minister that about 4,000 Israelis were in the cities under attack at the time. The fourth plane was shot down by a missile. An order had gone out from President Bush for the flight to be shot down if necessary, but before this could be carried out passengers attempted to charge the hijackers, who flew the plane into the ground in Pennsylvania. The Pentagon was hit by a missile, not a plane. The major damage to the building comprised a roundish blasthole, not the more extended destruction some assume would be caused by aeroplane wings. The theory ignores the bodies of passengers and crew at the site. Thousands of people saw the plane circle then fly into the Pentagon. Some photographed the scene. Hijacked planes were packed with explosives and flown by remote control. Some conspiracy theorists say the passengers on board were actually killed elsewhere and their bodies dumped at sea, or were part of the conspiracy and are now in hiding with new identities. the mobile phone calls the doomed passengers made to the outside were not possible because of the aircraft’s altitude. However, phone records show the calls were made from satellite phones fitted to the back of the aircraft seats. Conspiracy theorists claim holes made by the crash in Pentagon are far too small to have been made by a Boeing 757. One wing hit the ground; the other was sheared off by the force of the impact with the Pentagon’s load-bearing columns, the entire wing of the plane did not cut into the building. Experts who specialise in the behaviour of concrete buildings say a crashing jet wouldn’t punch a outline of itself into a reinforced concrete building. Terror Strikes New Delhi-Another black Wednesday in capital city of India!